"We run tings, tings nuh run we." Rude boi, get'cha rass claat ready fi de story bout dem one call Capone! I couldn't resist that one, especially after watching the movie Third World Cop. Typically when you hear 'Jamaica,' you envision beautiful beaches, clear blue waters, tropical fruit and reggae music. Jamaica also has a darker underbelly filled with drugs, power and poverty and this is where Third World Cop transports you. Capone (Paul Campbell) is a gung-ho, no-holds-barred type of street cop. He is sent back to his old neighborhood, a burrough of Kingston called Dungle, to help the local law enforcement. Upon arrival he discovers that this corner of the world if being ran by Douglas Jones aka Don Wonie (Carl Bradshaw), a ruthless one-armed bomba claat with no respect fi de law. While trying to make a case against Wonie, Capone discovers that Wonie's right hand man is Ratty (Mark Denvers), the brother of his best friend growing up. 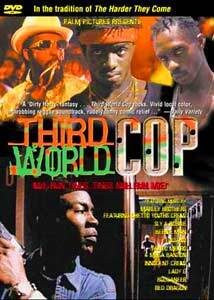 There's so much potential in Third World Cop that I'm kinda torn in my opinions about it. There's some great portrayals of character by some of the leads, specifically Ratty (Mark Denvers). I found myself drawn to him more than anyone else because his character has the most intricacies. There's an underdeveloped struggle that he has to deal with that's not really portrayed in the script. He has a dream to make it out of the ghetto and do something big, but he's trapped, "Hey, like blood claat body care bout we, investors no come down here, the government no care fa we and I can't get no real job cause of me blood claat address." (Ratty) He's a hero in his community because he uses the gun running money to host local events including a football team he's built. But in the eyes of the law, including Capone, he's a criminal. Paul Campbell does a decent job portraying the hard-nosed cop torn between his relationship with his brethren and his duty as an officer. Sometimes he comes across too brash, but I think that's because of the imposed hostility he has to face in the streets. The rest of the characters are very underdeveloped and sometimes you question their actual place in key scenes. Paul's relationship with Rita (Audrey Reid) was very questionable, I wasn't sure if she was a fling from the past or just an old friend. The film has one of Jamaica's leading dancehall MCs, Ninjaman playing the antagonistic Deportee. He overacts a little but with enough viability to pull off a successful role. There are a lot of plot holes, and I think the script could have done well with a once over. The effects definitely need to be reworked for this film to be a contender anywhere out side of Jamaica. Check out the firework type of sparks from the muzzles of the guns and the 'shot-boards' the actors wear are visible in just about every shoot out scene. Third World Cop is an interesting and vibrantly colorful watch. It could be considered a documentary or sorts if you're interested in seeing how the inner city life is in downtown Kingston. Image Transfer Review: When I started watching Third World Cop it reminded me of Dr. Who. Not in the content but in the way it was presented in its soap opera-ish style. The first thing that stands out is the color representation. This film has very vibrant colors, that are heavily saturated and there is some color bleeding. The image is crisp but there are a lot of compression artifacts visible throughout, detracting from the image quality. Black levels tend to shift a little throughout. A lot of this is attributed to the lack of proper lighting control for scenes. In chapter 6 (At Home) you can see this when Capone calls one of the youth to the car. When the camera changes, the image gets much darker. There's no dirt or specs on the print, mostly attributed to the fact that the film was shot digitally and mastered from the digital print. I would like to see this film remastered from a higher profile production studio (or a better compressionist) and see the difference it would make. Just like the film itself, the print has a lot of potential, but falls way short. Audio Transfer Review: I don't think that the audio track can save the overall movie but it does add a helluva lot to this presentation. The audio is clean and distinct. Vocals are crisp. There is some use of the LFE track when the booming dancehall reggae tracks kick in, but I would have expected more especially from the shootout scenes. The rear effects are used mostly for ambiance and atmosphere rather than any specific discreet sounds from either. The soundstage is mostly up front with some panning effects evident on certain scenes. The real issue lies with the Jamaican accents. It was a great idea to include the English subtitles. There are times when you have to rewind the film because you couldn't understand what was said. Without the subtitles, it would be very hard for anyone not from the Carribean to understand most of the dialogue. The soundtrack was produced in part by the Grammy Winning® team of Sly & Robbie. Those familiar with reggae should recognize the names. They've done an excellent job of keeping the sounds of Jamaica very present in the movie. The audio portion is by far, the best part of Third World Cop. Extras Review: Palm Pictures seems to have a grasp on the potential of the DVD format. They've included some decent extras on this DVD. The behind-the-scenes featurette is only 10 minutes, but it covers some of the issues surrounding the production. From budgetary factors ($500,000 budget! ), to filming locations, issues on the set with the locals and some insight from the actors and the production crew. Not that this is one of the best behind-the-scenes, but I think it adds a lot of understanding to the way the final product is presented. Without some of the insight from the behind the scenes clip, some of my ratings would have been lower. The original trailer is also included. The oddest thing is that the trailer is presented in a widescreen format. What to happened to this print? The compression on the trailer is much better than the film itself but the overall image is much darker. Audio is 2.0 stereo. The third extra allows you to sample some of the songs from the movie. Each clip is about 30 seconds and is presented in 2.0 stereo. The level on these song clips is rather low and they don't offer a loop option. After a clip stops, you have to move to the next clip and hit play. No biggie, but not well thought out. The next extra has clips from three other Palm Pictures feature films. Thicker Than Water, starring a lot of today's hottest rappers like Ice Cube and the ill-fated Big Pun. Dancehall Queen, Palm Pictures previous biggest Jamaican production. Mandela: Son Of Africa, Father Of A Nation, a documentary style look at the life of Nelson Mandela, starring Nelson Mandela. The last clip is an anti-drug message by world famous Lauryn Hill of Fugees fame. The clips are presented in 4:3 pan and scan format with 2.0 sound. The compression artifacts on some of these clips is downright outrageous. One scene from Mandela just breaks up into large pixelated blocks for about 2-3 seconds. The last feature contains weblinks to various sites. These aren't interactive by any means and don't use PC Friendly as an interface like most other DVD-ROM content. The sites linked are; thirdworldcop.com, islandjamaica.com, palmpictures.com, sputnik7.com and manga.com. The Third World Cop website is Shockwave Flash driven and has information about the movie. Sputnik7 lets you play streaming reggae in Windows Media format. Some decent features included in the extras, but I think a lot more time and effort could have been given to them so they could really stand out. I think that watching the behind-the-scenes featurette really helped me to appreciate this movie more. With a limited budget, hassles from the local community and time constraints, I think director Chris Browne did an Irie job with Third World Cop. For anyone who's into the Jamaican scence or dancehall reggae music, this one may be worth a glimpse.